And so it happened that one fall afternoon Fate gave me four quails, poor them. And pitiless as Agamemnon, I decided to sacrifice them to this blog, like modern Iphigenias bound to propitiate some kind of Goddess' wrath. But this time, as testified above, no divine intervention came to rescue the victims. Well...what can I say? There's always a first time. But due to my poor familiarity with such mystical experiences, I'd like to add that most likely this whole thing won't happen very often. But...Oh My Goodness, these quails are really tasty. Rinse quails, pat them dry with kitchen towel and rub them inside and out with salt and pepper. Mince onion and sauté it in a little bit of olive oil with the garlic clove, peeled and cut in half. After few minutes add chopped figs, brandy, 2-3 tablespoons of orange juice and grated peel of half orange. Season with salt and pepper and cook for few minutes until figs gets soft. Discard garlic clove. Let the mixture cool down a bit, then add toasted chopped pecans and bread crumbs. Adjust the taste with more salt and pepper, if needed. If the stuffing is too dry, add a little more orange juice or olive oil. 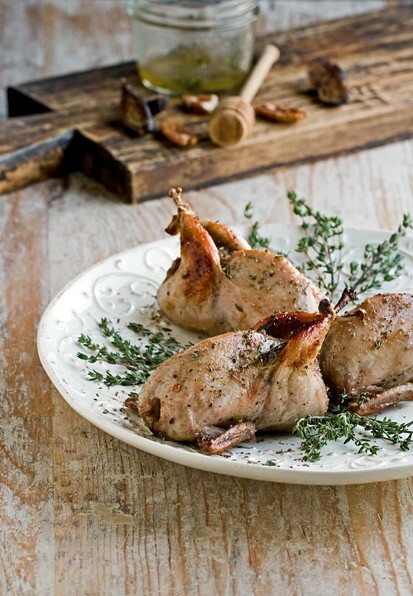 Place about two tablespoons of stuffing inside each quail, without filling them too much, tie their legs with kitchen twine and place them in a baking pan. In a separate bowl, mix 2 tablespoons olive oil, 2 tablespoons honey, 2 tablespoons orange juice and few fresh thyme sprigs. Brush about half of the mixture over the quails and bake them at 400. After 10 minutes, brush them with the rest of the marinade and bake for 20-30 minutes longer, until quails are nice and brown. خلال أيام الفوضى والانتقال الفوضويين المعروفين ، فإن إتلاف أثاثك الثمين - الذي قد يبدو سيئًا - قد يكون أقل شرتين. لسوء الحظ ، فإن الإصابات الشخصية بجميع أنواعها تعد أيضًا إمكانية حقيقية لذلك يجب عليك بذل كل ما في وسعك لتجنب الإصابات عند الانتقال إلى المنزل.